Whether you are just deciding on where to make your new home in Costa Rica or are planning a vacation in Guanacaste, Hacienda Pinilla offers the largest selection of amenities and natural wonders for property owners and their guests to enjoy – time after time. 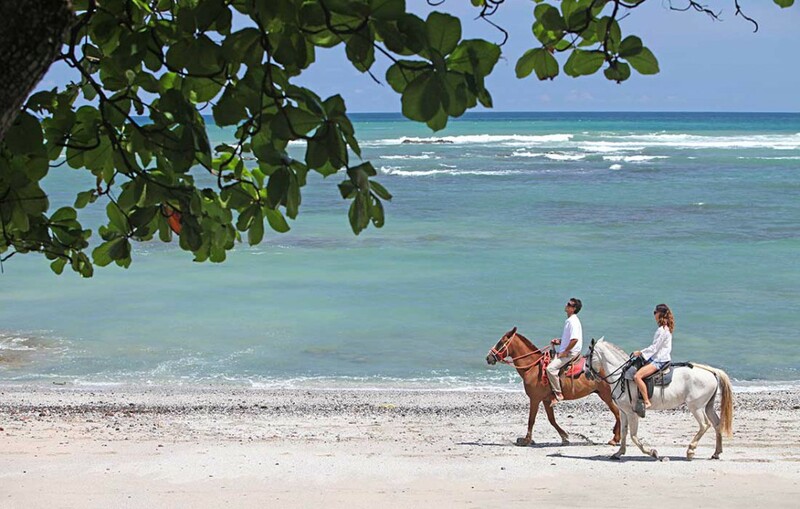 Whether you decide to soak up the sun at the Hacienda Pinilla Beach Club, ride horseback along Langosta Beach, or spend a day on the Pinilla golf course with family and friends, the selection of activities and benefits for homeowners at Hacienda Pinilla are seemingly limitless. At the “authentic Costa Rica”, modern day conveniences blend with rustic terrain dotted with uncommon luxuries. Hacienda Pinilla’s properties and vacation rentals all come with unrivaled experience that you and your family will want to enjoy time and time again. with modern conveniences, Hacienda Pinilla offers some of the finest Costa Rica vacation experiences for you and your family to enjoy time and time again. The Hacienda Pinilla Beach Club has an array of things to do from an infinity pool and convenient access to Playa Avellanas to fine dining overlooking the Pacific. From the beautiful sunrise to the spectacular Costa Rican sunsets, the HP Beach Club offers water activities and every indulgence for your perfect day at the beach. From surfing and swimming on Playa Avellanas to beachfront dining, wellness treatments and a fitness center, the Beach Club is the best place to relax or play in Guanacaste, Costa Rica. Perched directly on the shores of Playa Avellanas, one of the top ten beaches in Central America, you will find an infinity-edge pool, fine restaurant with ocean views, a tiki bar, wellness treatment rooms, and more. Evenings at the Hacienda Pinilla Beach Club are some of the most special. Here, you can gaze out at the famed Costa Rican sunsets with your family and friends and you swim, sip cocktails, dine, or simply relax under the watercolor painted skies over Playa Avellanas & the Pacific Ocean. 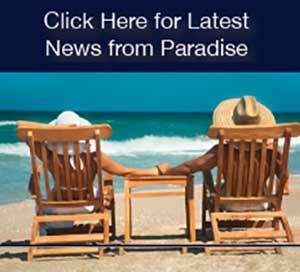 The Beaches at Hacienda Pinilla are some of the finest beaches in Costa Rica. Spread across 3-miles of Guanacaste coastline you can enjoy 3 beautiful beaches perfect for surfing, swimming, or lounging on the cinnamon sand and beachfront real estate in Costa Rica in an unrivaled, gated and private setting. Playa Avellanas, Langosta and Mansita each offer diverse terrains and shorelines, each with its own variety of activated and exploration from surfing and snorkeling and fishing to hiking, kayaking and horseback riding. Playa Avellanas: Also known as “Little Hawaii” this Hacienda Pinilla beach is home to some of the best surfing in Costa Rica and the World. Home to the Hacienda Pinilla Beach Club and drawing travelers from around the globe this beach is known for its huge swells, beautiful sand, shells and tranquility. Playa Langosta: A “Blue Flag” certified beach noted for its environmental sustainability. Langosta beach is bordered by Guanacaste trees and is ranked as one of the prettiest beaches in Latin America. This beach tends to be less crowded and very tranquil, and is one of the favorite spots for Hacienda Pinilla homeowners for viewing the Costa Rica sunsets. Playa Mansita: Located next to the JW Marriott Guanacaste, this is a beautiful beach with rich sand, rock outcroppings and lovely low tide that dramatically shows the shoreline and rock formations. Located at the Hacienda Pinilla Beach Club on the second floor, the new Oceanfront Fitness Center was opened in 2016 and is great place to get in a workout as you overlook the Pacific Ocean and beaches of HP. Featuring cardio equipment, free-weights, weight benches, resistance balls, yoga and stretching mats and other top-of-the line fitness machines, this is an exciting addition to the amenities at Hacienda Pinilla. 6 a.m. to 10 p.m. In order to utilize the gym you must be a Beach Club member or purchase the Day Pass. 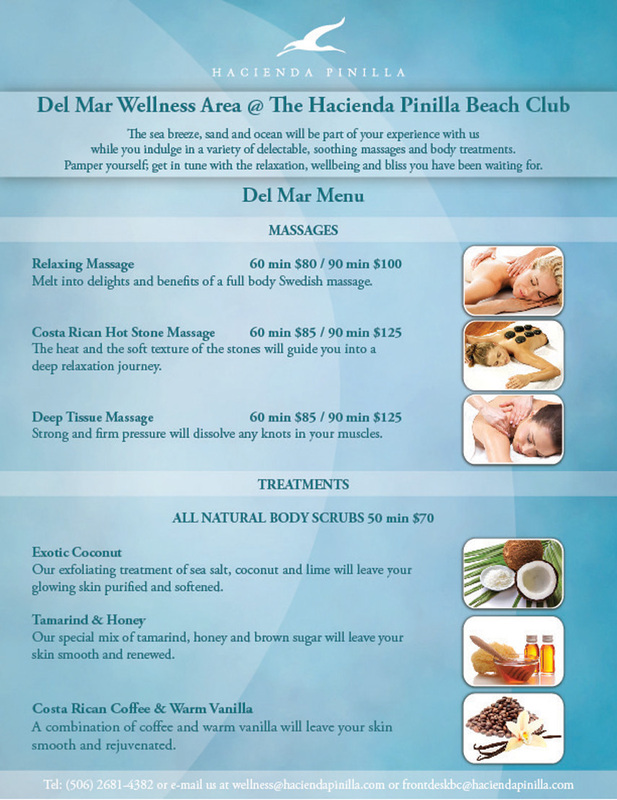 Located at the Hacienda Pinilla Beach Club, the DelMar Wellness Center offers a great place to relax and unwind. Open to property owners and guests, features a variety of treatments that balance and refresh your mind, body and spirit and the perfect indulgence. 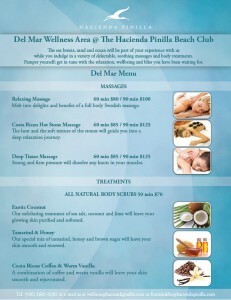 Enjoy exotic massages, facials, body scrubs and more. At Hacienda Pinilla Outdoor Adventures Abound! Up for even more adventure as you explore the Guanacaste landscapes and natural environment of Hacienda Pinilla? As a property owner or guest you can explore the Costa Rican terrain on a hike, take a fishing or sailing charter, explore the resort on the new Mountain Bike Paths, play a game of golf or tennis or take a beachfront horseback ride in Costa Rica from the Hacienda Pinilla Stables. Learn more about Golf at Hacienda Pinilla including course info, tee times and contact. The Hacienda Pinilla Golf Course provides a challenging yet serene golfing experience directly on the Pacific Ocean. 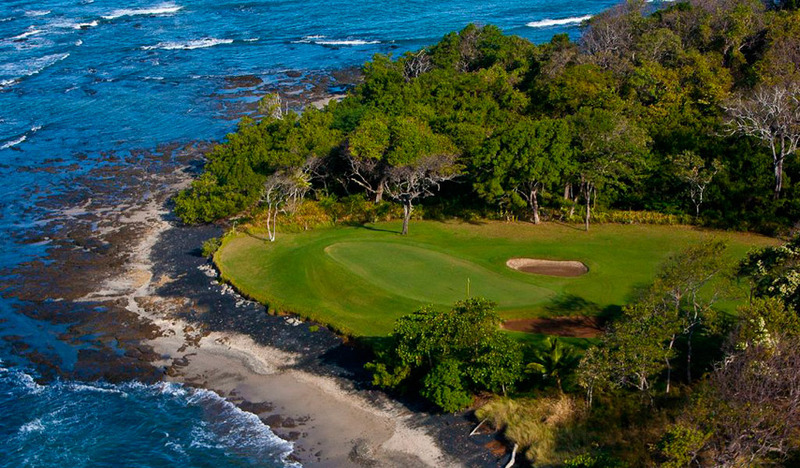 Enjoy 7,200 yards of links meets the ocean play on this par-72, 18 -hole golf course in Guanacaste, Costa Rica. Hacienda Pinilla’s tennis courts and tennis center are great way to live out your competitive spirit and get in some exercise in paradise! The resort community has 2 courts with top-quality surfaces and a resident Tennis Pro with over 25 years of playing experience, certified by PTR and USPTA. The Hacienda Pinilla Tennis Center offers private lessons, semi private lessons, group lessons, monthly doubles socials, kids after school programs, kids camps, racquet rentals and much more! Get up close and personal with Hacienda Pinilla as you explore on horseback! Trot along the miles of costa Rica beaches, trails, around the cattle ranches and natural forests. This is a great activity for beginners or experienced riders. Hacienda Pinilla has 16-kilometers of riding trails for the perfect family friendly adventure. Horseback riding trail rides and tours include a shuttle, tour guide, bottled water and helmet. Tours run Monday through Sunday from 7 a.m. – 4 p.m. Extended hours & 1/2 days including lunch are available. 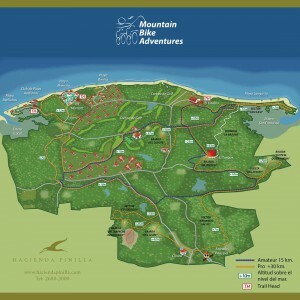 View a map of the mountain biking trails at Hacienda Pinilla. 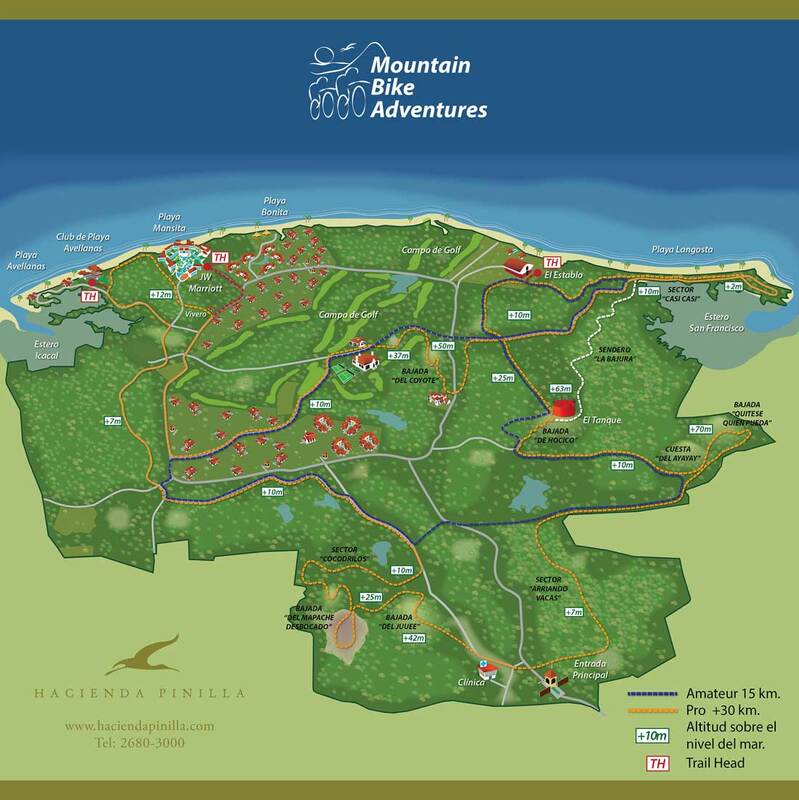 New to Hacienda Pinilla in 2016 are two rugged mountain bike paths. One path is for more professional riders, and one is a less intense trail for amateurs. The mountain bike paths in Pinilla take you through the resort’s 4,500 acres. Signs throughout HP guide you through the routes. Home to the Guanaride mountain biking competition, this is one of the newest and most popular activities at Hacienda Pinilla. Cost for mountain biking trail use is $5. Discover fine international cuisine and local, fresh farm-to-table dining at the restaurants at Hacienda PInilla. Avellanas Restaurant at the Beach Club offers two dining options- pool side casual dining or a more sophisticated experience at the open-air and oceanfront restaurant of Avellanas. Both are open daily and fine dining is offered on Friday and Saturday evenings at Avellanas. Hoyo 19 Bar and Grill – located at the Hacienda Pinilla Golf Course, Hoyo 19 offers casual fare in an informal setting that opens up to the greens of the award winning golf course. This is a great place for a cocktail or post-round snack. Hacienda Pinilla property owners and guests also enjoy access to the many dining options at the JW Marriott Guanacaste. The luxury resort inside Pinilla offers a choice of venues such as: Sabaneros Steakhouse, Asian-Fusion at Tamarine, or international fare at Mansitos. With the Amenities at Hacienda Pinilla, you will uncover a world of adventure in the setting of an authentic Costa Rican Ranch for endless memories and unforgettable experiences. Want to see more? Take a photo tour of Hacienda Pinilla, Costa Rica.